Learn to Draw Your Favourite Pokemon! Inside this Unofficial Pokemon book you will find 48 awesome one sided coloring pages.Each page will teach to draw one pokemon with step-by-step written instructions. The size of the pages is 8.5"x8.5". 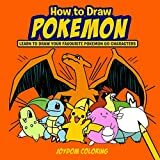 Learn to draw your favorite Pokemon: Pikachu, Charizard, Squirtle, Charmander, Bulbasaur, Jigglypuff, Snorlax, Chansey and many more! This book is great for kids, teens and adults as well - anyone who loves Pokemon! It will also serve as a fantastic Christmas gift. This book is NOT AN OFFICIAL POKEMON PRODUCT. Not approved by or affiliated with Nintendo. Based on the irradiated delicacies of the world of Bethesda Entertainment’s Fallout, this Vault-Tec–approved cookbook provides fans of the award-winning series with recipes inspired by their favorite Fallout foods. Whip up tasty versions of the Mirelurk egg omelette, throw some deathclaw meat on the grill, and re-create BlamCo Mac & Cheese with Fallout: The Official Cookbook. By the New York Times bestselling author of Hacks for Minecrafters! This is the greatest, unparalleled guide especially for readers who love the fight of good vs. evil, magical academies like Hogwarts in the Harry Potter saga and games like Terraria and Pokemon GO, ideal for both the young newcomer and the seasoned player. From abandoned mineshafts to mini-games, mods, and zombie sieges, The Ultimate Unofficial Encyclopedia for Minecrafters reveals expert tricks of the trade for gamers. This exciting book will cover everything players need to know about mining, farming, building, villagers, the Nether, and more! A big book of players’ hacks for Minecrafters organized in an easy-to-reference encyclopedia format, this book will show readers the ins and outs of the game, how to survive and thrive, and various mods that can improve play. The book is illustrated with screenshots throughout, making it easy for new and experienced Minecrafters to build, fight, protect, and survive in their creative worlds.